Dwight Beckham passed away on August 24, 2018 at his home in Hesston, Kansas. Dwight was born in Lamont, Oklahoma on April 25, 1931 to Wick G. and Gladys (Channel) Beckham. At the age 19, he married Helen June Barney. They were married on March 21, 1951 at College Hill United Methodist Church in Wichita, Kansas. They enjoyed family times, cross country bicycling, and they took many memorable family vacations throughout the United States and Canada. They were married for 62 years prior to her passing in January of 2014. Dwight lived in Lamont, Carmen, and Alva, Oklahoma before moving to Planeview, Kansas in 1942. After their marriage, he and Helen moved to Valley Center, Newton, Marion County Park and Lake and Hesston, Kansas. Dwight was a quiet and reserved man who loved music, teaching and working with the many students he taught throughout his career. He was a composer, always composing music in his mind. He loved his family and was very proud of his grandchildren and great grandchildren. Dwight spent 11 years as band director at Valley Center, 19 years as band director at Newton, 2 years as trumpet instructor at Wichita State University and 10 years as adjunct trumpet instructor at Bethel College. He played trumpet in the Wichita Symphony Orchestra for 25 years, the 97th Army Band for 2 years, and the Newton Mid-Kansas Symphony Orchestra for a period that spanned over 40 years and the Wichita Wind Ensemble Professional Band. He enjoyed a 64 year professional career as a trumpet player. When he was not teaching or performing he composed music for band and orchestra. He had several publications and a recorded CD. He, along with his wife Helen, enjoyed cross country bicycling and was involved with the historic preservation. Dwight was quick to volunteer to play Taps at military committal services to honor veterans. Jan (Dallas) Hodges of Broken Arrow, OK., and Dwight Jr. (Kathy) of Wichita, KS; six grandchildren: Steve (Heather) Girk of Bradenton, FL., Stuart (Brittni) Girk of Lenexa, KS; Julia Collins (Noah) of Colorado Springs, CO., Russel Beckham and Sidney Beckham of Newton, Lauren Hodges of Broken Arrow, OK., six great-grandchildren, four nieces, four nephews, several great nieces and nephews and his brother Kenneth (Joan) Beckham of St. Charles, MO. He was preceded in death by his wife: Helen Beckham; parents: Wick and Gladys Beckham; sister: Dortha Anne Bargen; brother: Hugh Beckham. A memorial service is scheduled for 2:00 p.m., Saturday, September 1, 2018 at the First United Church of Christ in Newton, Kansas. A visitation will be held from 5:00-9:00 p.m. on Thursday, August 30, 2018 at Petersen Funeral Home of Newton. The family will greet friends from 6:30 – 8:00 p.m. 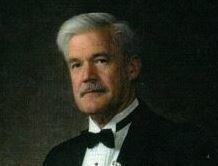 In lieu of flowers, the family requests the memorials be made to the Newton Mid Kansas Symphony Orchestra, 120 W. 6th Street, Newton, Kansas 67114. So sorry to hear of Mr. Beckham’s passing. He was one of the best teachers that I had at VCHS. I have such fond memories of his class & marching band. Am so sad to hear of this talented man’s passing. Have many fond memories of times together with Dwight and Helen. Our thoughts and prayers are with the family! the low, clear reveille of God. Thank you for your service to this nation. I didn’t have Mr. Beckham as a reacher, but remember him as a quiet and pleasant man. So sorry to hear this news. My thoughts and prayers are with you. So sorry for your loss of Dwight. I worked with at NHS where he worked in the music dept.. May the Lord be with each of you as I know Dwight is there playing his trumpet and writeing his music. Can’t believe i didn’t hear anything about it, and i am so sorry to respond so late. What can i say ? He was a colleague, beloved bookend and friend to my father for many a year, as well as my band teacher. He was a real stickler for posture and music excellence as my father was. He wasn’t the kind of person that told bust out laughing kind of jokes, but he did have a subtle dry humor reminiscent of George Gobel. It would be very difficult to list all of the experiences i had with Mr. B as my teacher, but i will say this; The sum total of my fathers work as a teacher etc..was not his alone. My father could have never accomplished what he did and have such a music program without Dwight holding up his end as an excellent teacher. God be with you always Mr. B, love Gary (Vernon) Fletcher Jr.